Local pastor and Helping Hand Me Downs volunteer Curtis Campbell moved to St. Louis with his family four years ago to take the role of discipleship pastor at MiddleTree Church in North City. He then discovered Helping Hand Me Downs through our operations director Kim Dann Messier, who encouraged him to volunteer with us. Our mission fits perfectly alongside Curtis’ work at MiddleTree, as the church focuses heavily on the role of the church as a contributor to its surrounding community. “We believe we should make every place better physically and spiritually - starting with our city,” their mission statement reads. Keep reading to learn more about his journey and the impact of volunteering with us. Tell me a little about your background and work with Helping Hand Me Downs. After I’d been in at MiddleTree for a couple of years, I was looking to volunteer somewhere outside of the church that was meeting the needs of those in North City. I was hooked from the first time I went in to Helping Hand Me Downs and learned what it was about. Hard to believe that was two years ago now. I started out folding donation clothing items and sorting it all into bags, then I moved into preparing larger donations and helping organize the space: cleaning, vacuuming, taking out the trash, moving summer bags into the winter storage space. Things like that. Going on deliveries was also very eye-opening, especially when you see how appreciative people are. It’s clear that MiddleTree is very devoted to the surrounding community as well. What does your role there entail? As discipleship pastor I work with local community groups, which pertains to a range of topics: men and women’s groups, bible studies, playing music and more. My role is really to work with people and develop the relational aspect of the church, whether that’s encouraging leaders to get involved, facilitating group study or something in between. My family and I moved here almost four years ago from Wisconsin to become part of this church, which was a bold move for us. But the mission was so compelling, and we knew the pastor at MiddleTree and his wife from our high school days. We were craving the kind of diversity St. Louis has, which has really been reflected in our life here. Our church is wonderfully diverse and our kids go to Lafayette Preparatory Academy, which is also very diverse. In approaching difficult issues and questions that have arisen here, I do my best to ask questions—to listen first and speak second. Do you have a favorite story, moment or memory that occurred through your volunteer work with Helping Hand Me Downs? I remember a couple of Christmases ago, Stephanie [Williamson, our founder] was up front talking to a family. The father was out of a job, they had three kids, and nothing for them for Christmas. We don’t normally do this, but Stephanie brought them to the back where all the donations are and encouraged them to pick out a few things. Man, you should have seen their faces. That moment of joy was so cool to see. That actually highlights one of my favorite parts of Helping Hand Me Downs: that it has connected me to these experiences I never would have encountered on my own. I remember the father chose a set of kitchen knives, because he loved to cook but had no utensils for their kitchen. The mother and kids followed suit, and they each left with something really special. I love seeing that, and being part of an organization that helps meet our clients’ physical needs while making sure they’re treated with the great respect they deserve. A church can do a lot to help a community, but it’s so much better to join something that’s already working instead of trying to start your own thing. Out of the many ways and places to volunteer, what made you choose Helping Hand Me Downs? When our church pastor and I started having conversations that led to us moving here, he told me that majority of single-family homes in the neighborhood where MiddleTree is located were occupied by single mothers. While that speaks to a lot of issues, on a human level I couldn’t stop thinking about how incredibly difficult that experience must be: the challenge of working and raising kids, and having to do it all without a partner. I kept thinking, if that’s the case in our immediate surroundings, who’s helping them? Do they have time and capacity to go to the grocery store? Buy clothes for their kids? Maintain friendships? Helping Hand Me Downs is so specific to that need, which is not easy to find. When I first started volunteering it was so enlightening to see all the moms coming in and then leaving with everything they needed. I couldn’t deny that there was no way I could do it better. Also, it’s a lot of fun. We all joke around and laugh a lot. You get to know Stephanie and the rest of the team, as well as the other volunteers. It never felt like a chore. How has working with Helping Hand Me Downs changed you? I was re-reading some of the blogs on the website from other volunteers and Kim Forney, who does deliveries and pickups, said something that really resonated with me. He spoke about the power of seeing people become so joyful and thankful, and I can really echo that sentiment. You see what it looks like for people who have to live so differently—and not that I’m some super wealthy guy who has everything I could ever ask for, by comparison. But there is a very real part of our community where people don’t have the bare, basic essentials that are required to live. They’re in survival mode. And I can’t think of anything more noble than helping people obtain those essentials. If you’ve been on the giving or receiving end of a batch of items from Helping Hand Me Downs, you’ve probably met one of our steadfast volunteers, Kim Forney. Kim first started with us by sorting donated clothing as it came in, and then transitioned into picking up and dropping off donation items in his minivan—which he’s been doing several times per week for the past two years. We’ve been deeply fortunate to have attracted some incredible volunteers like Kim to our mission. Learn more about what this ex-tech employee, veteran, husband and father has to say about working with Helping Hand Me Downs, and what drove him to support what we do. If you’re looking to volunteer with us, don’t hesitate to reach out! Learn more on our “Take Action” page. How did you originally get connected to Helping Hand Me Downs? It’s kind of a roundabout story. I’m not sure how much of this you want to include, but I’ll tell you anyway. My first wife passed away in 2013, and in 2014 I ended up going on a mission trip to Romania through JOY FM Christian Radio. On that trip I met the woman who ended up becoming my second wife. She lived in St. Charles County, and I started attending a church in that area that sent some of its members to volunteer with Helping Hand Me Downs. I became really intrigued with it once I heard the mission. I had been looking for opportunities to be of service, and it ended up being a really good fit. What has been the most rewarding part of this kind of volunteer work for you? I’ve gotten to see some amazing things that not everyone gets to see in their lifetime. When you’re picking up items from donors, they’re so excited by the fact that what they’re giving away is going to be used to help someone else. And on the other side, when you’re doing a drop-off and the client is home, you can see how much it means to them. They’re so overwhelmed and grateful that someone cares, and it makes a real difference in their lives. Just last week I was delivering a crib to a young mom with a new baby—it was freezing outside, and when I answered the door she asked if I was the maintenance man, because they’d lost heat in their building. Thankfully he was right behind me, and as she held this baby in her arms she looked at both of us like we were the answer to her prayers. It was a real reminder that the organization can help people get over a hurdle and keep going when things get tough. What did you do for work before retiring and volunteering? I worked as a programmer and analyst for over 40 years. I’d done so much work with computers during my career that when I retired, I knew I wanted to spend my time doing something that directly helped people. When I working full-time and in the Navy with a wife and three young children, I didn’t have time to do this sort of thing. I was always extremely busy. When I finally retired and had the time to give back, I thought, “Ok—here’s my opportunity to help people. But what do I do, exactly?” That’s when Helping Hand Me Downs came along. I’m sure other volunteer opportunities are good in their own ways, but I think St. Louis can obviously use as much positivity as possible. What do you feel makes Helping Hand Me Downs particularly special? It clearly makes such a difference to people who really need it—and it’s not just their physical needs. The organization has made connections in the community to help families with counseling, job assistance, housing assistance and more. The team behind the mission is also an amazing group. Stephanie [Williamson, our founder] is a lot of fun to work with, and very supportive. There’s a lot to get done in a short period of time without a ton of money, but it’s so worth it—especially for people who are retired, or young people who’ve gone down the wrong track. If you can give them the opportunity to do something meaningful and helps others, they can thrive. Funny enough, I feel the same way about being retired. Once you get here, you realize it’s not all it was drummed up to be. You still want to find meaning and purpose. Volunteer work offers a different kind of reward—nothing like climbing the corporate ladder for money and prestige. Instead, you get to appreciate having a positive impact on someone else. Kim Dann Messier was pregnant with her youngest child, now six years old, when she first met our founder Stephanie Williamson at a neighborhood barbecue. She’d been on the hunt for a way to be of service in the community, and started volunteering at Helping Hand Me Downs once a week. That steadily grew to twice a week, then three times a week—which is how it happened for many of our full-time employees. Eventually Stephanie offered Kim a full-time job as operations director, a role she’s now held for us for over three years. As operations director, much of Kim’s work involves hammering out the logistics of the organization and interacting with parents we serve, as well as other volunteers and employees. Nonprofit work also runs in her blood: she grew up volunteering, her mother ran a nonprofit for several years and she even took a few master’s level courses in nonprofit management. While she didn’t know it would all culminate in her current role with us, we’re sure glad it did. 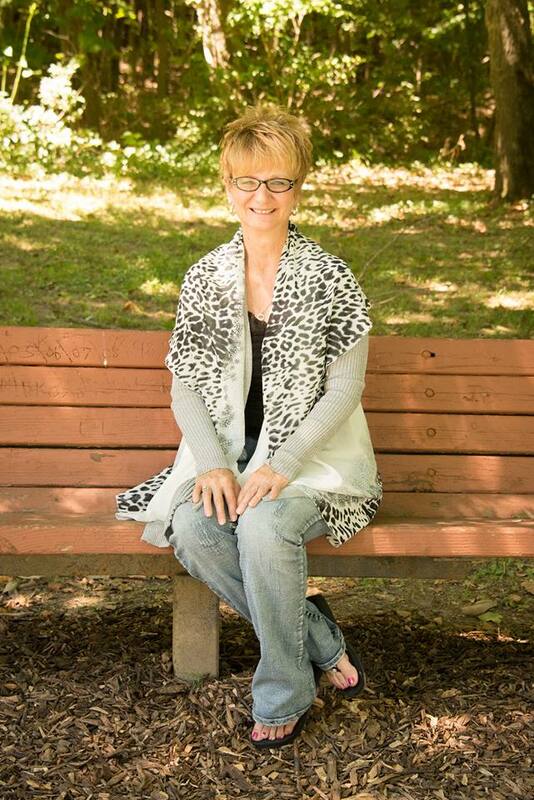 Keep reading to learn more about Kim’s story and what inspires her every day. There are so many volunteer opportunities to choose from when looking to get involved in service. What was it in particular that drew you to Helping Hand Me Downs? Honestly, becoming a mom was a huge part of it. When I met Stephanie, she told me that baby swings were one of the top donation requests they received. They can even prevent child abuse, because they calm down children and babies who won’t stop crying. My two kids loved their swings when they were babies, and I could really relate to the mission to help other mothers. I know how challenging it can be, and that really resonated with me. I may look or dress different from the moms we serve, but I’m a mom too. I can relate to worrying about your kids and doing everything you can to make sure they are safe and happy. Then of course, working with someone like Stephanie—her passion and personality really pulled me in. And now we basically share a brain; it’s like we have a telepathic connection. I’ve had jobs before that I couldn’t stand, and now I really love what I do. How does your work with Helping Hand Me Downs directly impact the community? You’d really be shocked to see how invisible the problem can appear. Most people don’t even know that moms are needing the most basic items you can think of to care for their children. But when you’re working directly with the moms and kids, you see how absolutely vital this work is. Even the most simple things, like being able to provide a bed for a mother or her child. The impact is really tremendous: that child is going to perform much better in school the next day if they’ve had a good night’s sleep on a comfortable mattress. We also have our Bring it Back program, which allows a client to receive new items once their child has outgrown newborn clothes and toys, for example, which they return to us. They’re also encouraged to come back and work with us as volunteers, sharing their experience with other parents. The fact that they’re able to use their experience to help other parents is really remarkable. That way, it doesn’t feel like a handout. What are some of the largest obstacles you’ve seen that the families you serve are up against? We can help take care of their basic needs right away, whether they need clothing, shoes, toys, beds, a car seat, etc. But many of the moms we see are dealing with domestic violence, abusive relationships and really difficult issues. I make sure everyone in a situation like that walks out with a phone number for a women’s safehouse. A restraining order is just a piece of paper. We also have families come in who are dealing with some sort of massive crisis: they’re homeless, enduring a period of unemployment or living paycheck to paycheck. Thankfully, we also have a number of partners where we can refer clients to create a real safety net for them. Monica Wade, who went through our program as a client and now runs our Pagedale office, is a great example of success. But, she’s also the exception. She works incredibly hard, and even comes in on her days off to volunteer with us. Real change takes time, work, and the realization that it’s not going to be easy, even with support from resources like ours. How do you create some level of separation between your work and personal life? I imagine those lines get blurred when you’re working with people in this kind of vulnerable time of real need. Sometimes it is hard to detach. Talking with Stephanie and Monica and other moms on a daily basis really helps. And working with Mary Brown, our resident life coach. Sharing what we’re going through with her is a really powerful experience. Some days it’s really hard, but I try to keep it in perspective. What we go through is really minimal compared to the moms we serve. And then there are some days where I actually don’t really want that separation—with my kids, for example. My children go to University City public schools where a percentage of the students qualify for free or reduced lunch. My five-year-old asked me about that one day, and I had to explain to her that not everyone has parents who can pay for basics, like food and clothes. It was a really hard conversation to have with her. But I think it’s really important that they get a realistic picture of the world, and to learn how to be kind, compassionate people. After retiring from a 30-year career as a secretary at a community college in Poplar Bluff, Missouri, Mary Brown had just divorced her third husband and moved home to care for her aging parents. Needless to say, it was not the easiest time. “I’m good at keeping everything shoved down and not really dealing with anything. The problem is you can run, but you can’t hide. No matter how far you think you’ve shoved it down, at some point in your life, it manifests,” she says. Luckily, she also connected with a neighbor who worked as a life coach around that time. “She was the very first person who I told absolutely everything; my darkest fears and insecurities. Everything. Before that, I didn’t care about life anymore,” says Mary, getting teary. Together they began coaching others, which eventually led Mary to the coaching curriculum she lives by now, called core alignment. She later became acquainted with Helping Hand Me Downs through a friend and began coaching parents who came through the program—which she still does to this day, helping them build self-esteem with simple tools and affirmations. As she puts it, the results have been extraordinary to watch. What kinds of issues do you work on with the women you coach through Helping Hand Me Downs? As you can imagine, many of them have experienced many difficulties: divorce, abuse, toxic relationships, the trials of being a single mother, and so much more. The coaching really starts with making a connection to them. Then they learn skills and tools that help cultivate strength, confidence and positive thinking, which really brings about significant change in their lives. That’s how we increase our self-worth, which is what I’m all about. When you know who you are and can stand in who you are—not who you think you should be to everyone else—you’re able to navigate life much better. You can hold a job, provide for your family through a meaningful career—those externals really start to straighten out once you address what’s going on inside. How do you cultivate those tools and help your clients operate from higher levels of self-esteem? The most important thing is to help the women feel really safe and comfortable, so they can share and really open up. Once that connection is made, we start to set intentions. I’ll ask, “What are you emphasizing with intent? What would you like to work on and see come into your life? What is important to you?” We take it step by step from there. It’s not just about dealing with what they’ve been through in the past, but what’s triggering them in the present. That’s such a powerful sentiment—brings to mind that age-old quote about how life is really an inside job. Exactly. That’s been true in my own experience as well. I had all this emotional turmoil after I retired from my first career, and made a lot of poor choices based on lies and old beliefs. If I’d been able to get a grip on that, I could have made decisions that resulted in fulfillment. When we connect our mind, body, heart and spirit, amazing things happen. That’s what we mean by core alignment. For me, among other things, my faith and my relationship with God have grown exponentially. To get there, we help the women shift what they’re focusing on. When we first start working with them, much of their energy and attention is almost all focused on the negative. When we completely dwell on the negative, that’s where you’re going to stay. Focusing instead of what you’re grateful for is such a powerful tool. We look to change the language of how they speak to themselves, which is so important and can really affect outcomes. Monica Wade, who now runs the Helping Hand Me Downs Pagedale location, is a great example. I coached her at the beginning, and she’s done so beautifully. We started a group coaching session together with some other moms going through the program, which is always a really powerful experience. We share what we’ve been through and strategies that have worked for us, and we give them time to share as well. A lot of those women don’t get that anywhere else. What have you learned over the years as you’ve continued doing this work? We all want that instant gratification, but the damage that has transpired in us didn’t get there overnight. It takes time to undo all of that, and it also requires a lot of self-care. That could mean meditation, journaling, taking a bath—something you do that is only for you. Most of the women we work with have young children, which, as any mother knows, sometimes means it’s hard just to go to the bathroom in peace. But even if you can carve out five or ten minutes to find your quiet place, it makes such a difference. The women we work with start to like themselves more, which is an amazing transformation to watch. They’re able to address what they aren’t getting and take care of themselves emotionally. They recognize the light inside of them that they have, and learn that they’re inspiring others when they don’t even know it. Leah Greenaway and Debbie Speh, two devoted volunteers who now run our brand-new House Springs location, originally got connected to Helping Hand Me Downs through their parish and one of our amazing outreach partners, The Crossing church. The Crossing frequently brings groups of members to our locations as volunteers, which is how Debbie and Leah originally began their journey with us. They started coming in together once a month to volunteer, helping gather and sort donation items to redistribute for families. Their responsibilities continued to grow alongside their enthusiasm, and soon enough they began coming in once a week, instead of once a month. “Then it was two times per week,” says Leah, who lives in House Springs. Debbie lives in High Ridge, the next town over, and both recognized the need for a Helping Hand Me Downs location in their community. Thanks to their availability, timing and the perfect location, we were able to open the House Springs location, set to open officially on December 1, 2018. Keep reading to learn more about Debbie, Leah and the new location. What led you to jump into nonprofit work with Helping Hand Me Downs? Leah: Helping families in need has always been a really deep desire for both of us. Then of course, meeting the people—not just the clients who come in, but the people who run the organization, like Stephanie, Kim and Monica. We’ve all gotten to know each other really well, and they’re wonderful ladies. The most moving part about it is meeting the families and helping them find the things that we need. There are several questions we need to ask them before they can pick up their items, and their answers really tug at your heartstrings. I often get teary-eyed. Debbie: When we started, I don’t think I completely understood the whole complexity of it. Like Leah said, some of the questions we need to ask are difficult. At that point, you realize how good you have it. The people who come in who have very little are so appreciative of what we’re able to give them. They might come in to pick up a bag of clothes for their newborn, and if we have a crib or a car seat or something like that we can offer them, we’ll give them that as well. And they’ll say, “Are you sure? For free?” It’s a really amazing feeling to be able to do that for someone else. One of the strongest parts of the program is that clients have access to so much more than just clothing and items for raising children. Having worked closely with the families, how do you think that has impacted them? Debbie: It’s true that there’s so much more to it than handing out bags of clothes and supplies. There’s a really strong community that has formed around doing this work. For families who need it, we can help them find employment or housing, and there are even opportunities for mothers who have been through the program to come back and volunteer. Their experience is incredibly valuable. Monica Wade, who now runs the Pagedale office, is a perfect example. She’s a mother of three young girls who had no support, and now she’s a full-time employee. We’ve seen a lot of stories like that play out: where the women return and give back to the program. Leah: It’s also really promising to see how willing people are to help themselves. I don’t think I ever fully realized how difficult it is for some families out there, just to get by. Seeing the need is really eye-opening. And the satisfying part is that we can help them, then watch them come back and help others. It’s an amazing thing to watch a parent leave us knowing she has what she needs to take care of her children, whether it’s diapers, formula or a carseat and everything in between. The nonprofit world is full of organizations that are well-intentioned, but don’t always have the desired impact. In your experience, how do you think Helping Hand Me Downs different? Leah: First of all, we have to remember that it really takes a lot for a mom to come in and ask for help. So the first thing we try to do is create an environment where they’re not going to be judged, and help them feel good about doing the right thing in order to provide for their children. Debbie: Mothers have a powerful instinct to provide for their children—and when they can’t, it’s horrible. It’s the worst feeling. But we can help them provide. And if they need additional help, like buying food, securing a job or housing, we can work within our networks to get them that assistance, or we can refer them to another organization. There are a lot of really great organizations that want to help and are doing an amazing job, so we don’t try to do everything by ourselves. Helping Hand Me Downs House Springs officially opens December 1. Donation drop-off times are Monday through Friday from 9am to 12pm. Darnisha Ray originally connected with our program through a social worker after giving birth to her first child, Aniya at St. Mary’s Hospital five years ago. Sixteen years old at the time, she also suffered complications during her pregnancy; doctors had to perform an emergency C-section after she contracted lupus. Her daughter, now a healthy five-year-old, weighed just three pounds when she was born. Darnisha’s mother passed away from breast cancer when she was twelve, leaving her to take care of her younger siblings with very little long-term family support. 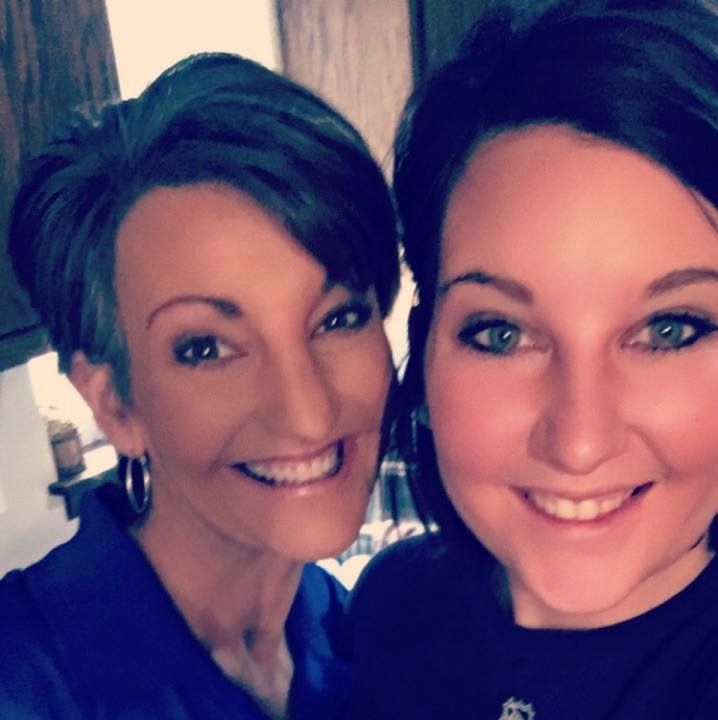 After the birth of her daughter, she moved in with a friend’s mother and graduated from Mehlville High School in 2015, before attending cosmetology school immediately after. She had her second daughter, Nazaria, just over a year ago. “My mother taught me how to be strong. I guess I’m just that kind of person,” she says, debating whether to write a book about her life one day, when time and emotional capacity permit. In addition to raising her two girls, Darnisha also works for a local catering company at Enterprise Center downtown and is in the midst of completing coursework to become a pharmacy technician. Her choice to put faith in the greater good when faced with adversity, instead of what can go wrong, is immediately apparent. “If sharing my story could help change somebody else’s life for the better, I want to tell it,” she says. What has it meant to you to have the support of Helping Hand Me Downs in your journey of motherhood? When I got out of the hospital with my first child, Miss Stephanie [Williamson, founder of Helping Hand Me Downs] was like a stepmom and a mentor to me. I’ve been in my apartment now for four years, and when I first moved in I reached out to Stephanie through the program and she brought so much more than just clothes and baby essentials. She knew I didn’t have furniture and I’d been sleeping on the floor, so she brought me a bed for the baby, and one for me that a friend had donated. She also brought some other furniture, blankets, sheets, covers, pots, pans, books and toys; all kinds of things. I was going through a storm at that time in my life, trying to keep my head up for the next blessing. I was put through a lot at a young age and had to grow up really fast. Overall I learned that the program and the people who run it will always been there for me, regardless of what is happening in my life. And even if I go a long time without asking for help, it’s always there. So few mothers who get pregnant in high school actually graduate. You graduated from in 2015 and went on to college immediately after. What kept you so motivated, and what are your dreams for the future? I really don’t know. It was incredibly difficult, but I was just determined. I moved in with a friend’s mom, who helped me set up day care and things like that. There were days I wanted to just give up, and she wouldn’t let me. After my mother died I had to take care of my younger siblings, which is how I learned how to raise kids. In the case of my daughters, I definitely do the most, but both of their fathers are involved—they’re willing to do their part. God puts us through all kinds of things for different reasons. As far as what I’d like to do in the future, right now I’m at a bit of a standstill. I had to take some time off from school to work full-time and I had some babysitting issues, but I’ve been chipping away at my degree to become a pharmacy technician, which I plan to finish next year. It changed me dramatically, for the best; even when life feels like it’s at its hardest. Motherhood to me is like planting flowers. When you leave, you’ve created something beautiful for the world and it’s your job to make sure they grow, and grow with them. I’m able to have peace with whatever happens in this life because I’m looking up to something else. The spirit is more than anything we can imagine. There is negativity, but I don’t let that affect my mindset, even if it’s impacting my immediate surroundings. I didn’t have two girls to fail them, or me. They are an image of me. I don’t look in the mirror everyday—I look at them. What advice would you give to moms who are considering the program, who are where you’ve been? I would tell them to work hard to keep a positive mindset for their children. That’s the best thing you can do for them, regardless of what anyone else around you is doing. You want to keep them unharmed and innocent, which often means you have to take on the bulk of the hardship. If there’s help available to you that will impact you and your children for the better, use it. And don’t abuse it. Mother-daughter team Valerie Phillips and Rachel Pruneau, respectively, didn’t intend to challenge the stereotype that mothers and daughters can’t work together―though they have their moments, as Valerie says. 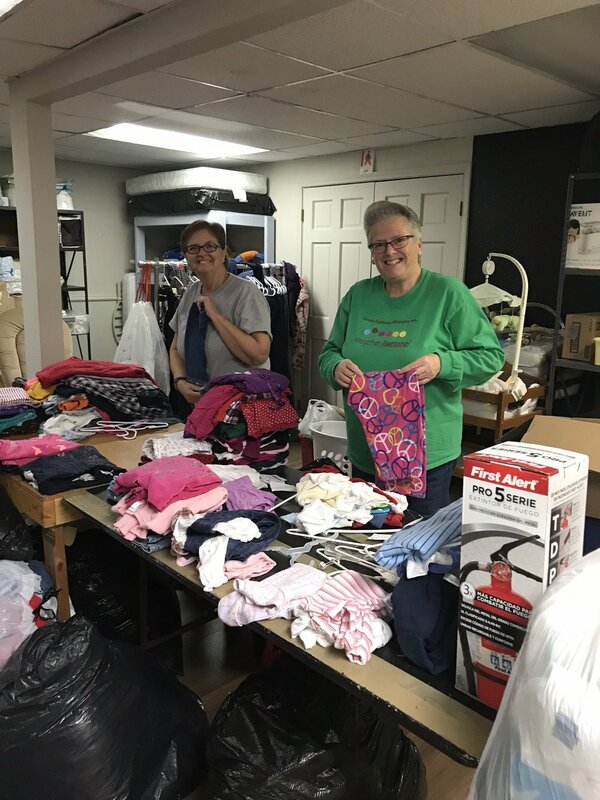 Together they run the latest Helping Hand Me Hand Me Downs location in Crystal City, Missouri, with the goal of serving Jefferson County and the surrounding area. Valerie’s journey to nonprofit work came from an inherent love of helping others, but also her own adversity, in the form of an abusive relationship with her daughter’s father and the death of her infant son due to SIDS (Sudden Infant Death Syndrome), which left behind the near insurmountable task of sorting through the extreme grief. It was the latter that propelled Valerie into working with Infant Loss Resources 17 years ago, and organization that serves families affected by infant loss and seeks to share information and resources to prevent it. She eventually served as the organization’s Pack-n-Play coordinator, which connected her to Helping Hand Me Downs’ founder Stephanie Williamson. Keep reading for our Q&A with Valerie to learn more about her journey and experience. What galvanized you to spearhead the opening of a Helping Hand Me Downs in Crystal City? Stephanie and I connected back when I was working with Infant Loss Resources, and we’d refer new clients to each other. I live in Jefferson County, in Festus, and a couple of years ago my daughter and I started collecting items for families during Christmas. We knew a grandmother who’d gotten custody of her grandchildren and needed basic items to house them: things like a new bed, furniture and clothing. So we started there, and just kept moving forward. It became very clear to us that there was a strong need for what Helping Hand Me Downs does in Jefferson County, and my daughter and I were trying to figure out how to make that happen. We began talking to Stephanie about opening a location here, and it worked out really nicely. It’s been a really great partnership that we know will benefit a lot of people. As someone who has experienced many of the traumas that many of your clients have endured, do you find that you’re uniquely suited to be helpful? I really do. We had a woman who came in last week, for example, who’s pregnant and staying in a shelter for women who are victims of domestic violence. I could relate to her. When it became clear I could no longer stay with my daughter’s father, we left with a trash bag full of clothes and that was all we had. I gave her my number and told her to give me a call if she needed anything. I also give everyone a pamphlet on safe sleep information, which lays out how to put your baby to sleep to prevents SIDS, accidental suffocation and other problems like that. I’m not shy about my past. I understand, and I’ve been through much of what the families who come in here are dealing with. It’s incredibly difficult. What is it like to be on this side, where you’re able to help others with your story and experience? It’s an amazing feeling. And being able to provide them with the basics, just those simple things they need to get by, is very fulfilling. We don’t have a ton of people coming in yet because we’re still so new, but we’ve been getting the word out all over town and giving them our information. We went to the Division of Family Services to let them know we exist--they were ecstatic--all the way to the police department. You never know where you’ll find people who are looking for the kind of services we provide. Our offerings are starting to grow as well to meet the need, so we don’t just provide newborn clothes and items. We also have feminine products, personal hygiene products, shampoo, toothpaste, toothbrushes and things like that―things you can’t get with food stamps. We even have clothes, shoes and accessories for adults as well as household items, like pots, pans and dishes. Basically what someone would need to start over. We also have a ton of referrals on hand to agencies and individuals who can help support clients in areas we don’t specialize in. So if we have someone come in who really needs a particular service, we do everything we can to help them. How were you able to rebuild your life amidst all of the challenges you went through? I guess I’m just a strong person [laughs]. If you’re going to make a change, it has to be something you’re willing to do for yourself, which ensures you’ll actually do what it takes to move forward. And being willing to forgive yourself and others who have harmed you, so you can move on. Rachel’s dad, for example, wasn’t in her life at all until the past couple of years. He has made some real changes in his own life. He grew up in an abusive family himself and regrets what he did. Funny enough, he’s actually come out here to help us out with a few things: we had a broken window in the building here, and he came over and fixed it for us. Today I pray that his temper has come around. But I can no longer hold a grudge; that just hurts me. I do think that people can change, if they really want to. But you can’t make them. If you head to our Pagedale office on Page Avenue, you’ll be greeted by manager Monica Wade, whose wide smile often belies the depth of her work handling the day-to-day operations of the location. No two days are ever the same: one moment Wade may be prepping intake for a new mother, providing her with newborn clothes and supplies, or gathering referral materials for families looking for a home or work. Born and raised in the University City neighborhood of St. Louis, Wade originally went through Helping Hand Me Downs’ program herself when pregnant with her third child three years ago, and returned as a volunteer before we asked her to come aboard with us full-time. Keep reading to learn more about how Monica persevered in the face of much adversity, and how she has arrived at success and fulfillment. How did you originally hear about Helping Hand Me Downs and get involved with the program? I originally came to Helping Hand Me Downs in 2015, after my sister told me about it. I was pregnant with my third baby at the time and really needed some newborn items. I met Stephanie [Williamson, founder of Helping Hand Me Downs] when I came to pick up some items, and she encouraged me to come back as a volunteer. After I had my baby, a girl, I came back every week to volunteer like clockwork. Eventually she offered me a job running the Pagedale branch, and at first I was reluctant. I’d never been in a management position before, and wasn’t sure how safe the area was. But she kept reassuring me and eventually I decided to to it. I’m so happy that I did; I love it. What does your day-to-day look like here? Usually I begin with client intake—though I typically don’t call them “clients.” I just call them, “my moms.” Some dads come in, but it’s mostly moms. I give out the clothes and supplies, and if we don’t have something they need I do call-arounds to see if we can find it. If they’re homeless or looking for a job, I refer them to a few different agencies we work with to see if we can help that way. Some of them are worried they can’t get jobs without a degree or high school diploma, and we refer them to GoodWill, which has a high school diploma program. A lot of people also come in just looking for food, so I hand out fliers with information about local food pantries, or just take them to the cafe next door for something to eat. Truly, no day is ever the same. Did you have support along the way on your journey to parenthood and nonprofit work? I have received a lot of unexpected blessings along the way. I still do. But I came up poor, with very little. I never met my dad, and I have six siblings—my mom raised us on her own. Sometimes we had no food in the refrigerator or gas in the car. But even so, I have to hand it to her: we all turned out well. I did lose a brother to gun violence a few years ago, which has been incredibly difficult. I can’t imagine. I’m so sorry for your loss. If I may ask—I’m not wording this the right way, but how do you ever, I guess, move through something that? You can’t. You go on, but you really can’t. It’s like—you’re just stuck. And it’s a really terrible, common thing in St. Louis: most people know someone or have a family member who’s been lost to gun violence. The violence is just crazy. So I help people, and I love it. That’s what I do. Thank you for your incredible honesty and vulnerability. And it sounds like you’re creating something different for children than what you had growing up. I do go above and beyond for my daughters, because I don’t want them to ever be without. So whatever I have to do, I do it. I figure it out the best way I can. I was 26 when I had my first, and she’s now 16. I also have a 13-year-old and a three-year-old. You have highs and lows. Growing up, I had so many things I wanted to do. I needed someone to push me. I remember I wanted to be a policewoman, then a detective, then an archaeologist. I used to dig for hours in this local creek. I loved playing in it; I’d get all these different rocks and fossils. I always said I was going to do that. I didn’t go to college, so I’ve gotta make sure my kids go. I used to work at an assisted living home as a resident assistant, and I’ve thought about going back to school to become a Licensed Practical Nurse. I have to show my kids that I’ve done something. That’s always in the back of my mind. Helping Hand Me Downs grew in response to the realization that the distribution of resources is not equal or fair. St. Louis is obviously also very racially and socioeconomically segregated. Do you see the impact of that segregation and disparity in your work? Have you had women come in with stories that have really moved or pained you? There have been several. One woman came in recently who needed basics like body wash and socks for her daughter. Her social worker was supposed to pick it up from us and he didn’t, so she came in herself to get it. I gave her everything she needed, and as we were getting it ready she just broke down and started crying. She told me she had an abusive boyfriend who beat her. He’d steal her car and drop her off at random places. She had her daughter with her, so I took them to the cafe next door and got them some food. I also gave her Mary’s number coaching. That really hurt my heart to see. But I’ve found that as much as I want to, I can’t do it all. But on the other hand, we have so many moms who come back and are so appreciative. That makes my day. They thank you in a really genuine way, or bring their kids in and hang out on the couch while they play. I love that. Stephanie Williamson started Helping Hand Me Downs out of her home in 2011—and she still remembers the painstaking process of washing tiny onesies and other pieces of newborn clothing in her basement, all of which had been donated or picked up from the local Goodwill outlet. Her living room had exploded with donations, and soon enough the organization had grown enough that it became clear she needed to open her first brick-and-mortar location. Now, seven years later, the nonprofit is a thriving mainstay in St. Louis. 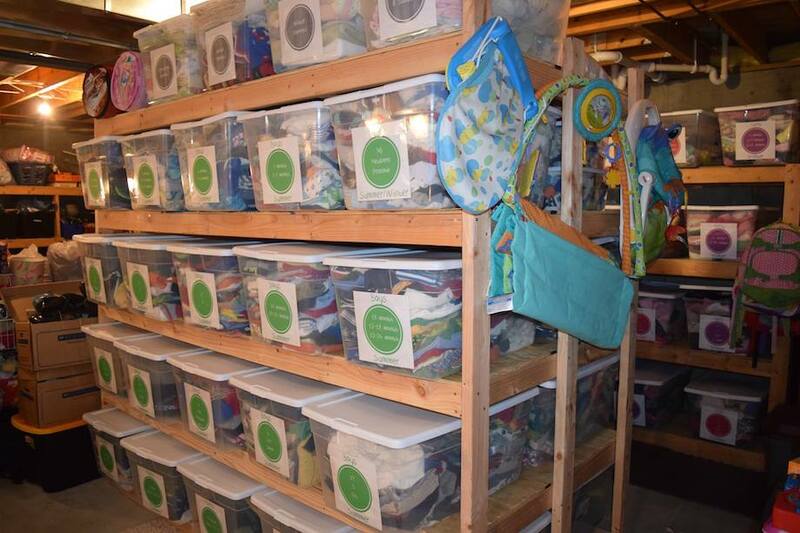 With three locations in University City, Soulard and Pagedale, the nonprofit provides families in need with vital newborn baby supplies, like clothing, bottles, carseats, blankets, strollers and more, as well as clothing, backpacks, shoes and coats for children of all ages. Last year they served over 4,000 children, redistributed over 200,000 donated items, and 98% of funding went straight to programming. The nonprofit’s program offerings grew alongside the need, and now Williamson and her team also work with social workers to help families find housing and employment. Williamson herself is the ultimate mom: she has two biological daughters (Sydney and Sophie, ages 19 and 16, as well as two adopted children, Marcus and Olivia, ages 8 and 5. She lives with her husband in University City, and her journey of how everything came together is truly fascinating. Keep reading to learn more. What was the catalyst that led you to start Helping Hand Me Downs? At the time I had two biological children, but my husband and I also decided to become foster parents. I had spent years in the business world at that point, but that really wasn’t where my heart was. I knew I wanted to do something that served the community, so I started interviewing social workers—around 40 total—whose clients were new moms, and asked what they needed most. Overwhelmingly, it was simple things like car seats, clothes, bottles, strollers—the basics. That's where the idea really started. I thought there were programs already in place that helped new moms with basic newborn supplies, but since most of them are government-funded, there are so many stipulations. So there really was a gap that needed to be filled by what we do. What was the biggest challenge you faced in getting this initiative off the ground? Definitely funding. The way the nonprofit world often works, you need a financial track record behind you in order to receive funding. We got so fortunate in that first year: our space was donated to us, so I paid no rent or utilities, and we received so many donations. We’d also shop at Goodwill, wash all the clothing in my basement and redistribute it. On October 14 of this year we’ll celebrate seven years since we started. Last year we served around 4,000 children, and for each child we provide around 50 items or more. So last year alone we had around 200,000 items donated to us that were reallocated. It’s been amazing to see how it’s grown. You might think getting the word out about what we do would have been a challenge, but it was actually much easier than we thought. The social workers I’d been speaking with could not wait to start referring their clients to us as soon as we were up and running. The only qualification we require is that the family be the client of a social worker or another like-minded organization. Also, I hate paperwork and I don’t think it’s fair to ask women who are in crisis to present it. We don’t want to deny services to anyone who needs them, ever. Diverging a bit into your personal journey, how did you decide this was the area in which you wanted to serve the community? I love children. I would have more if my husband would allow it [laughs]. Not everyone feels that they can love children who didn’t grow inside them as their own, but that was just never the case for me. First we decided to become foster parents, but we became “foster failures” because we couldn’t let them leave once they came into our care. That’s how we originally connected with our son, Marcus. He came to us when he was a baby, and it was originally intended that he’d stay with us for a month while caseworkers explored his grandmother as a possible guardian. They ultimately found that she wasn’t a suitable guardian, but even so, there were about five days where we weren’t sure if we’d be able to keep Marcus. And I remember thinking that if God allowed us to raise him as our own, I’d never ask for anything else. If you don’t mind me asking, what is Marcus’ story? How did he come into foster care? Many of the stories of how children end up in foster care are painful and difficult, which is very much what happened to Marcus. His mother was addicted to heroin—she delivered him at St. Anthony’s Hospital, left and never came back. She also gave birth to Olivia—our daughter, whom we also adopted—a few years later. Between Marcus and Olivia, she contracted Hepatitis C from a contaminated needle, and they needed to draw blood from Olivia when she was born to make sure she didn’t also have it. To do the test properly they need to draw quite a bit of blood, and she was just screaming in pain. It was one of the hardest things I’ve ever had to watch. A year ago, their birth mother died. And today, what I feel for her and their father more than anything is sorrow. No mother would knowingly leave her child at a hospital like that. It was so clear that she was suffering from an illness. Their father was also a star athlete, and there are times when I watch Marcus excel in sports, or Olivia rocking it in soccer, scoring goals like crazy on all the boys. It cracks me up. And I’m so sad that their biological parents don’t get to experience that—all the joy they bring to our lives. We’ve never shied away from talking about adoption with them. We keep the outfit Marcus was wearing when he was officially adopted, and he asked if he could bring it to school for show and tell. I tell them that while they both grew in another woman’s stomach, they grew in my heart and God meant for us to be together. I’m sure they’ll have more in-depth questions when they get older, but right now they’re very settled and comfortable. You’ve mentioned that your services are most needed in communities of color. Living in St. Louis in particular, which has become an international epicenter of discussions around 21st-century race relations, I’d be remiss if I didn’t ask how you’ve approached that element of your work. I find much of that tension can be diffused with lightheartedness, humor and respect. The moms we work with are so used to not being believed, turned down or treated like a number. Our organization is a strong, diverse community where everyone is treated with respect, no matter their background, and the moms see that pretty quickly. This kind of work also brings together families of all backgrounds and races, and you get to see them evolve. One of our moms, for example, went through our program and now runs the Pagedale office. It’s incredible to see their growth. As cheesy as it sounds, what we ultimately try to do is love people wherever they are on their journey, connect with them and care. People know when you care and when you don’t. It seems like you’ve also really taken the art of empowering your clients to heart, made evident by the fact that parents who have been through the program often return to Helping Hand Me Downs as volunteers and help other parents. You also help them secure jobs and housing. How did those pieces of your mission grow? When moms would come in for their intake, we’d ask them things like, “Are you at risk of becoming homeless in the next 90 days?” And so often they’d say “Yes,” or tell us it was a real possibility. The more we dug into their respective situations, the more we found things that were really unfair: moms who had their babies in the NICU for weeks, which is not cheap, and they’d have to miss work or their landlords wouldn’t work with them. So we help them find stable housing and employment with reputable companies. It’s been an amazing ride, and I look forward to growing our offerings even more. AN EVENING TO REMEMBER: WIN TICKETS TO OUR GALA SEPTEMBER 29! Upon entry below, two winners will each win a pair of tickets ($200 in value) to our upcoming gala at the The Crown Room in Ballpark Village in Downtown St. Louis on September 29! Scroll to the bottom of this post to enter the Rafflecopter contest, or keep reading to learn more about Helping Hand Me Downs and all the details you have to look forward to as this amazing event draws nearer. You can also purchase tickets here. 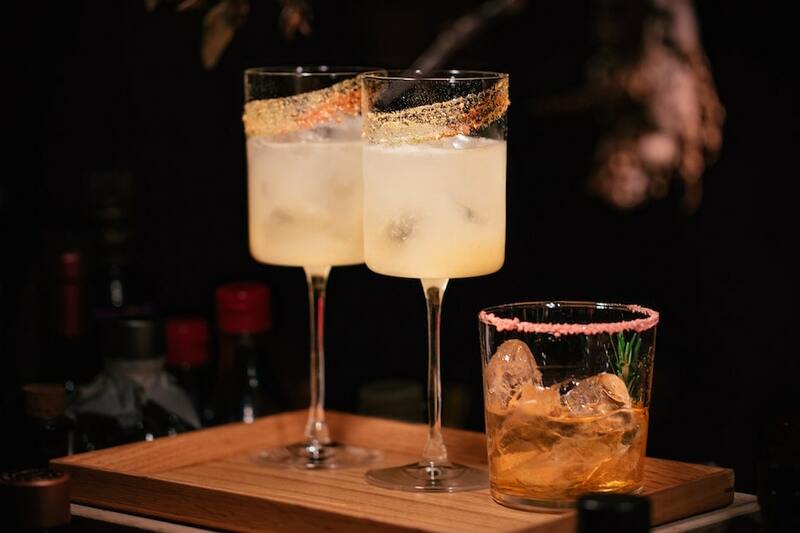 When you hear “gala” or “fundraising event,” you might immediately think of an evening where ticket prices soar upwards of $500 and guests must endure a lengthy presentation from the organization’s leadership—but let us stop you right there. For starters, we have firsthand knowledge that our founder Stephanie Williamson (with four children in tow) has no time for anything of the sort, and that her primary goal is for all in attendance to enjoy food, drink, music and entertainment in celebration of a worthwhile cause. “It really is a super fun night. And I’m not standing up and boring everyone with a begging for money speech, or anything like that,” she says, laughing. Secondly, tickets start at $100, which include cocktails, heavy hors d'oeuvre, access to our silent auction and music from renowned St. Louis-based DJ Mike Gow (named Best Club DJ by the Riverfront Times), who has played high-end venues in the city for years to audience acclaim. Gow’s set will continue on all night long, with contemporary musical stylings that are sure to get you out of your seat and up on the dance floor. Bump it up to VIP status for $150, which includes a reserved tabletop plus cigars and champagne, so you can really channel your inner Marlon Brando. It’s the perfect way to round out the summer with a last hurrah before fall settles in—so come decked out in your favorite old Hollywood glam, have a drink and let loose with us! We first embarked on the adventure of throwing a gala last year, centered around celebrating the six years we’d been serving the St. Louis community and the extraordinary families we have had the absolute privilege of meeting along the way. We gathered together to honor our steadfast volunteers, moms, community partners and donors who gave in-kind gifts. And this year, it’s all about having fun. Enter here for your chance to win two tickets to this year’s Helping Hand Me Downs Gala on September 29. The entry period will close on September 27, and two winners will be chosen on September 28. We’ll contact winners by email on September 28. Be sure to bring a photo ID and tickets can be picked up the day of the event at check-in. Good luck!